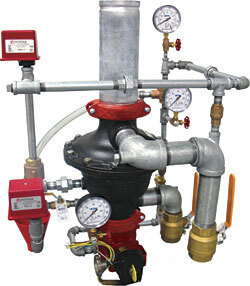 Dry Pipe Valve for fire protection system is reset by re-establishing air pressure to the system and then pressurizing the valveâ€™s priming chamber. The G-4000 has a pressure rating of 250 PSI and features a lightweight, ductile iron body with black E-coat. Available in a 4-inch size and includes complete, factory-installed trim components.